Here’s an improbable tale: a yankee girl with an addiction to fried pickles. I’m not really a yankee, but I’ve never lived further south than Oregon for any length of time, and I last lived far south when I was 4, in Homestead, FL. So whence the passion for fried pickles and smoked meat? Well, about 12-15 years ago we stumbled across a restaurant called the Muddy River Smokehouse in Portsmouth, NH. 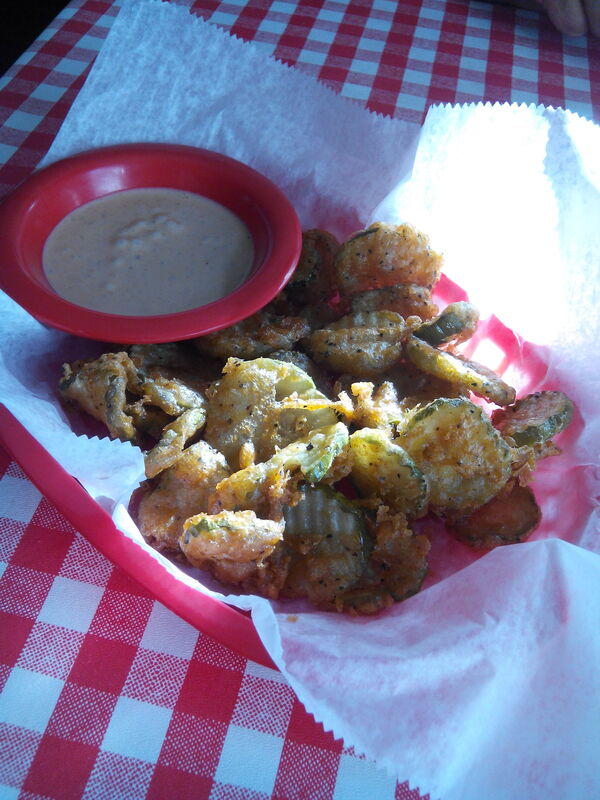 The food was good, the atmosphere fun, and the fried pickles… I’d died and gone to heaven. Time passed, more babies came. We made it over the ninety minute drive to the Muddy River maybe once a year… until one year it was just gone. I was sad. At this point we did a lot of BBQ and smoking at home, and I had figured out how to make the fried pickles, but it’s a time-consuming process, and the one thing I had less and less of as time passed was time. I was working a fair, a couple years back, and I could smell pickles frying, but couldn’t for the life of me find them. Sheer torture. Arriving here in Ohio, I discovered the Lee’s Chicken (which was a new chain to me, but they have gizzards, a fond childhood memory of eating at a roadside shack with my Dad) and they had fried pickles on the menu. I was all excited – until I ordered them. Spears with bland breading are just not what I wanted. This week we went down to Kentucky to visit the folks, and on the way home decided that we would stop for dinner, and that we would try and find a non-chain restaurant. It’s a challenge to do that right off the interstate. We started looking at the signs, and when I spotted the sign for Red State BBQ just north of Lexington, we pulled off. It was another 2 miles off into the gorgeous grassy horse country, a pretty drive in its own right. The restaurant itself was the restaurant to one of those old motels that have all but died out with the establishment of the interstate system. The motel is still in business, but I suspect it has more long-term clientele, from the racks of drying clothes. But I digress. Inside, the restaurant was very clean, and looked like a BBQ place if you know what I mean. I sat down, saw the fried pickles, and promptly ordered them. Before the cokes, I think. I was hopeful! 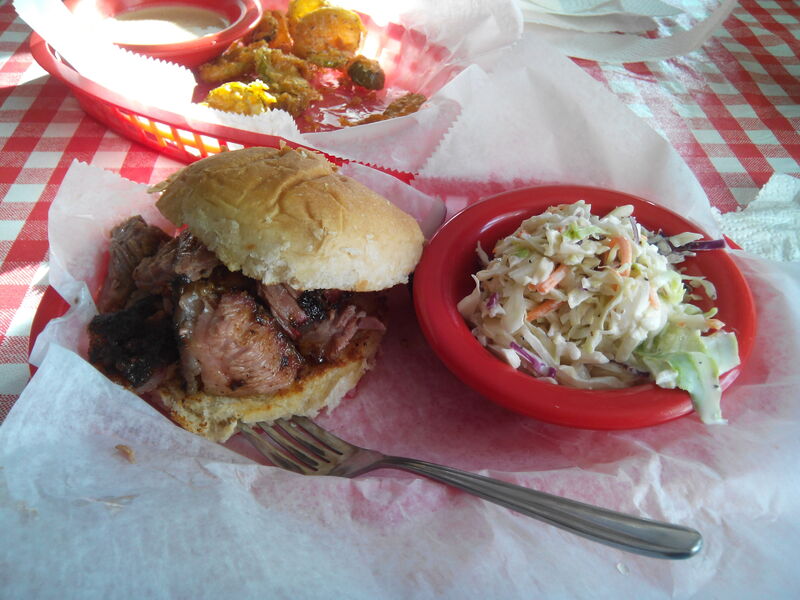 We also ordered the sliced brisket sandwiches with coleslaw on the side, and he got baked beans with his. During the brief wait, I looked out the window next to me, and was tickled to discover two horses grazing in the long grass paddock next to the building. Fried Pickles, fresh, hot, and so good. When the pickles arrived, they were perfect. Flavorful batter, the spicy texas ranch dip was excellent with them, and I dug in. Then the sandwiches arrived, and I have to say that was the tenderest brisket I think I have ever eaten. Great flavor, too, smoky and… I could have eaten without the sauce. The coleslaw was not sweet at all, a change from the usual fare, and fresh-made. His baked beans were also made, and had a terrific flavor, with more smokiness. 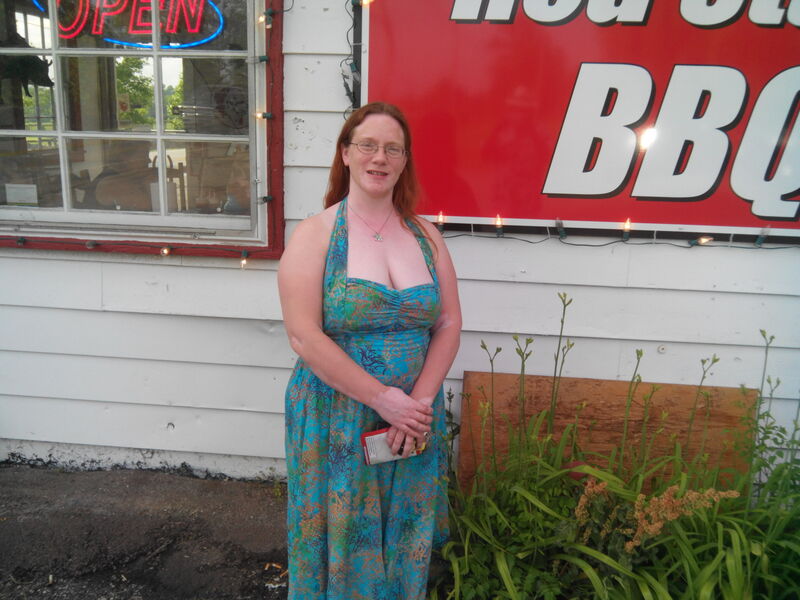 All in all, we were very happy, and plan to make the Red State BBQ a regular stop on our monthly trips. Tags: coleslaw, fried pickles, kentucky, Lexington, red state BBQ, restaurant, smoked brisket. Bookmark the permalink. Not sure where you’re at in Ohio but we just vacationed in Logan Oh and ate at Millstone BBQ. It was very good.Didn’t try the pickles though. Also if you have never been to Hocking Hills it is a great state park. We are right between Cincy and Dayton. I will have to look Logan up.